There is nothing I love more that being in a new place and trying out all the new, delicious things offered there. I may not be the world’s most adventurous eater, but I am willing to try anything that looks interesting to me. Chiang Mai certainly did not disappoint, but who am I kidding, I was in Thailand, of course the food was going to be phenomenal. 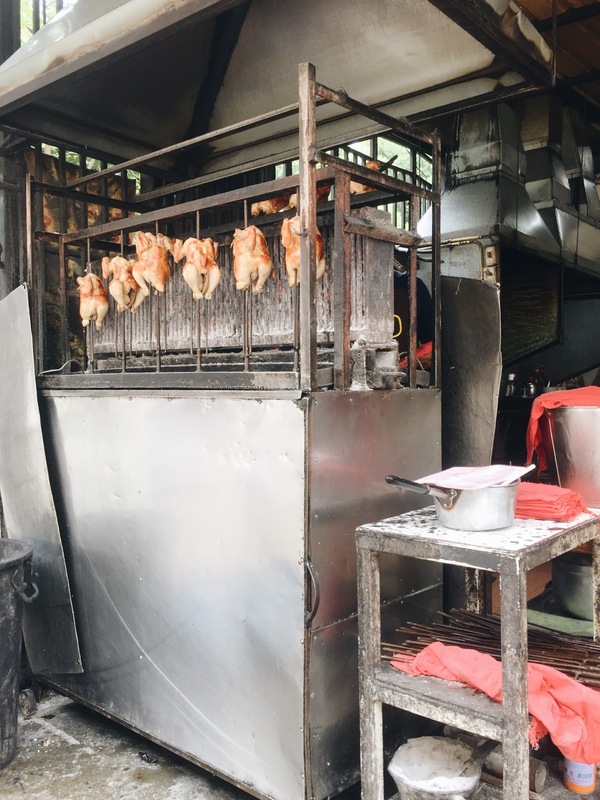 And so here are my food adventures in Chiang Mai! We ate here on our first night in Chiang Mai as it was the nearest to our apartment. When we arrived a queue was already forming. This place was obviously popular amongst tourists. We waited only a few minutes to be seated (so don’t be put off by the long line!) and right away we looked at the menu eagerly. I have to be honest here, I thought the food here was just okay. It wasn’t the best I had while I was in Chiang Mai. I ordered some curries, vegetable stir fry and their vegetable spring rolls – all was reasonably good but I just didn’t find the wow factor. This might be an unpopular opinion though since there are a lot of good reviews on this restaurant. My sister ordered the coconut ice cream that Thailand is popular for, I tasted it and it was nothing special. However, I do think this place is great if you want a taste of Northern Thailand cuisine at an affordable price. Its location is also a win since it is near the city centre. Perhaps you’ve been here and thought it was good, what did you order? This small restaurant is situated in Nimmanahaeminda area, which is an area popular for its hip cafes and cool hang out places. I originally planned to go to Rod Yiam Kitchen but when I arrived there was a long queue, this time I wasn’t so patience since I was really hungry. I had already marked several places around this area and they were all pretty close to one another. Zood zood was among the closest and I was drawn to their small yet clean space. The food here are pretty simple rice and noodle dishes. Since I have a weak spot for anything with garlic, I settled for rice and fried pork with garlic. My sister had fried rice and pork crackle. My dish was absolutely fantastic. It was simple, savoury and just what I had in mind when I think of fried pork rolled in garlic, there were even some friend garlic bits which added a bit more garlicky zing into the dish. Fried pork with garlic – YUM! My sister’s dish on the other hand was a bit sweet (and that’s coming from me, a Yogyakartan who is used to sweet dishes!). I think the sweetness came from the pork sausage bits that were in the fried rice, overall it was not the fried rice we were used to. My dad opted for a vegetarian noodle dish. The noodles were thin and springy, it was just like “mie ayam” in Indonesia. They poured this green chilli sauce on top of the mushrooms that accompanied the noodles. The sauce was sour and tangy, it somehow complemented the whole dish really well. Zood zood is definitely great for those who want simple Thai food. One of their plusses is that they open until late! One of the things on my Chiang Mai’s MUST EAT OTHERWISE I WILL REGRET IT list was of course Khao Soi. I have to blame this on Sharon since she raved so much about the dish when she was in Chiang Mai (she basically had this dish every day hahaha), so I was super curious! Out of all the places she mentioned on her detailed post dedicated to khao soi (see how obsessed she is? :P), I settled on Khao Soi Nimman. When I arrived the place was OF COURSE packed with people. Luckily we found a seat pretty quickly and I practically dived into the menu. I picked their khao soi with sausage (sai oua) and I also ordered their chicken satay to share. 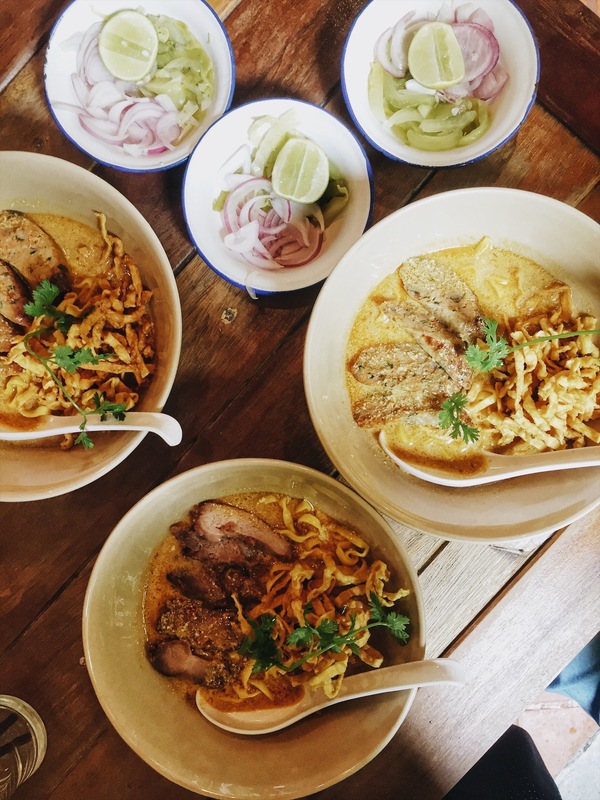 When my khao soi arrived, I immediately slurped my way into it going “oohhh aaahhh” – it was embarassing. I can totally understand why Sharon loved it. The soup was coconuty and though it was thick with huge flavours, it didn’t overpower the whole dish. The yellow noodles was heavenly, just the way I like it and the sausages had this spicy and slightly sweet note to it. I really appreciated the crunchy yellow noodles on top (because what is a dish without some crunch!) and also the slice of lime and onions on the side to add a bit more flavour to this dish. This was definitely a-must-eat-otherwise-you-will-regret it kind of dish. By the way, their chicken satay was also very good. I know you’re probably thinking “why would you order chicken satay when you have them in Indonesia?”. I know right? I don’t know why either guys but the thought of chicken satay always makes me drool. Theirs was really juicy and it was all meat. Definitely recommended! My dad’s friends took us here for dinner. The place is located near Payap University. I love the ambience of the whole restaurant, not too fancy, very relaxed and it has an open-air area which was wonderful as I went there in the evening, with a slight breeze in the air. I didn’t take any pictures (would’ve been kind of rude to do so since they took us out and we were guests) so you just have to take my words for it. They specialise in traditional Northern Thai cuisine and it was perfect for newcomers like myself. Our hosts ordered us a platter of different kinds of things which included pork crackle (kap moo), northern thai sausage (sai oua), fermented pork sausage (naem) and vegetables. All of these were meant to be dipped in the chilli sauces that came with it. There were two kinds: nam prik ong (red chillies, pork and tomato) and nam prik noom (green chillies, garlic and onion). Both dips were delicious and the platter really gave us a taste of different types of food available in Northern Thailand. By the time everything arrived I was overwhelmed by the amount of food that I’m pretty sure I missed a few dishes. That’s okay though, I was really satisfied with the rich red curry I tasted and was really giddy by laarb mung moo (spicy minced pork salad). I mean it’s minced pork SALAD – surely it’s healthy?! I really wanted to revisit this restaurant during my visit but sadly there was no time! 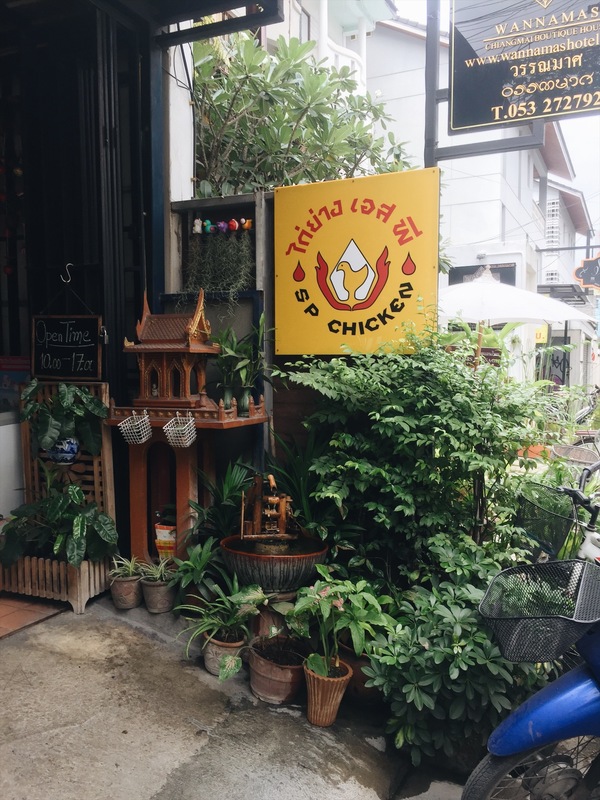 If you’re planning to go to Wat Phra Singh, then make sure you visit SP Chicken too. The restaurant is very close to this wat and it is worth your time and money. A lot of people have recommended this place so I had to give it a try. Their speciality is….well you’ve guessed it, chicken. Grilled chicken to be exact. It was the most perfect grilled chicken I have ever tasted. The skin was crunchy, the meat super tender and when paired with warm rice, it was truly heaven sent! We ordered their veggie stir fry and mango salad – both were equally scrumptious and paired perfectly with the chicken. Oh they do all look good Gy!! Now I am even more curious about Chiang Mai!! Chiang Mai is definitely a foodie paradise, I’m so glad I got the chance to visit it. I think you will like it too! Baca pos ini kemarin langsung aku like dan bookmark Aggy. Hari ini baru sempet komen. Aku juga bookmark semua posnya Sharon tentang jalan-jalan dan makanan di Chiang Mai. Love banget so TFS! Chiang Mai menarik ya ternyata. Sering dengar tapi baru baca detailnya di beberapa tulisan kamu. Kulinerannya kenapa mengingatkanku dengan Ho Chi Minh. Di sana apakah mayoritas makanannya Babi ya Aggy? Kayak di Portugal kan mayoritasnya seafood dan babi.